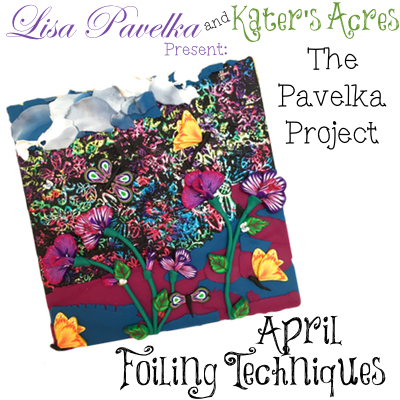 Idea: I waned a wooden canvas project that would resemble a scrapbook page with spring like elements of flowers, featuring my cane work, and a “rough” undone feel with jewel toned colors to match the foiled Pavelka Peel effects. The pristine colors & elegant feel of the foil should marry well with the exactness of the canes adding a Bohemian grace with the torn clay elements. Techniques I used: traditional Foiling & the Pavelka Peel (see Lisa’s Book), Scayning using my own cane designs (technique by Teresa Pandora Salgado, featuring in March/April 2015 Polymer Cafe Magazine), Look-at Blend by Christi Friesen, 2-in-1 Petals from my reversible petal canes, Debbie Crother’s millefiori flower petals, & my own caning patterns, technique, & designs. First be sure you have a solid & workable idea as dialogued above. Then choose the size of wooden canvas tile block you would like to use. I chose a 6×6 wall panel. Open your wooden block and gently sand your block on all sides & front surface using a 200 grit sandpaper to get rid of really rough edges. Choose your polymer clay and run through a medium setting on your pasta machine until fully conditioned. NOTE: I did NOT fully condition my polymer clay as I wanted a rough edge. Lay your clay on the block and trim to size using a blade. Choose your foil and place your choice of foil on your clay. Apply your foil to the clay using a burnishing technique. TIP: My favorite burnishing item is a plastic spoon! I did not use all the foil all over my clay. Rather I placed the foil randomly to get a wider variation of color that appeared more random. I then added a stamped design to my clay using Christi Friesen’s “In the Meadow” stamp to go with the flower theme of my wooden panel. To finish my tile I began by tearing strips of thin polymer and placing in a patchwork pattern for the background. PROJECT NOTE: Notice how originally my top & bottom had the same colors on top & bottom. At the very end I didn’t like the top and chose to replace it with a custom “look-at blend (by Christi Friesen)” in the dark blue, grey, & white colors of the sky. I also added ridges, waves, & bend to make the clay have a clouded sky appearance. I then added stems, and caned leaves where I wanted my main flowers to go. Using my 2-in-1 petal cane variation, I cut & sliced canes to make 4-5 petaled flowers & adapted Teresa Pandora Salgado’s “scayning” technique. I also added my canes from Debbie Crother’s flowers and used them as a dragon fly & 2D butterfly. I then made & cut my own butterfly wing canes to add a pop of bright yellow & orange to the piece. To finish my wall art I baked the wooden tile, covered in a foil pan, for 75 minutes at 275 degrees Fahrenheit. This longer baking time (despite thinness) helped to fully harden the clay as well as leaving the polymer clay canes that made the full 2D effect far more durable to touch & handling over time. The Pavelka Project is done in conjunction with Lisa Pavelka. Please make sure to read about the project here and get answers to the most common FAQS here.